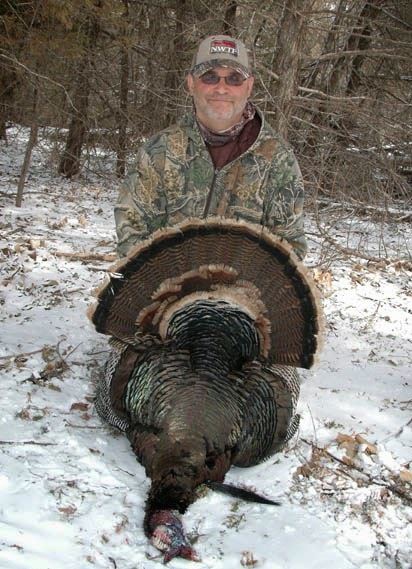 I was able to arrive at Uncle Buck's Lodge by noon on the day before my scheduled three day hunt. Since the previous hunters had already tagged out and the weather forecast for the next few days wasn't good, Scott told me to grab my gear and off we went. An hour later I had my trophy Merriam. Fortunately I have a good heart as this bird was taken at 6 yards. The next day, in a snow blizzard and 30 mile per hour winds we navigated a long stalk on a trophy Rio Grand Turkey which I harvested at 35 yards. 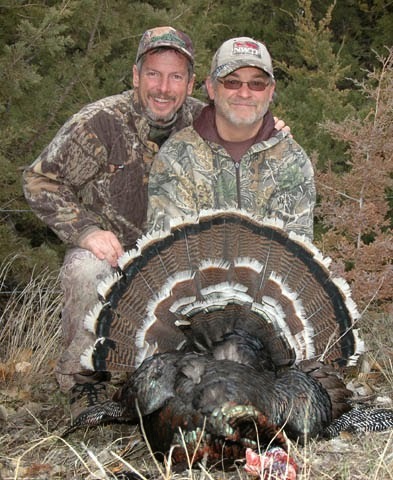 I would like to thank the Nebraska Hunting Company for his help in getting me a Merriam's turkey. Scott is totally committed to getting you a turkey. He is focused on hunting and will put you on birds. For me this is the third leg of a Grand slam, now only needing the Osceola. Another group hunting while I was in Nebraska completed 3 grand slams! One needed a Merriam's, the other two needed a Merriam's and a Rio! Thanks to Nebraska Hunting Company for my Merriam's and awesome hunting memories. Thanks to Marilyn and Walt for the hospitality and wonderful accommodations at Uncle Buck's Lodge.